Elmwood Stock Farm has been growing produce for farmers-market customers in the Georgetown, Ky., area since 1994. Meats and eggs have been added since then, and we’re now providing organic vegetables, meats and eggs year-round to farmers-market customers in Kentucky and Cincinnati. Sat., 8 am-12 pm: St. Matthews, Beargrass Christian Church at Browns Lane and Shelbyville Rd. 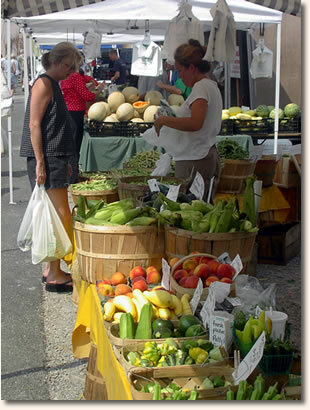 Sat., 9 am-1 pm: Broadway at Washington St.
We have all-organic Elmwood Stock Farm meats, eggs and vegetables available at most every farmers market, unless noted above. To see when your favorite produce items will be coming to market, check our availability schedule. Additionally, if you’d like to submit your restaurant order or make any special requests, contact us at least 48 before the market, and we can bring it for you.